Originally written for the Oyster Century Club, click here for more info on participating! Here at Element Seafood, we’re proud to be a family-run, regional seafood distributor. But what exactly does that mean? Ask the average person to name the primary actors in the food system, and chances are they’ll name farmers, retailers and consumers, but forget about distributors. However, distribution is a key element for getting food from farm to plate, one that cannot be ignored as our food system evolves to be more localized and responsive. In fact, New York City recently launched a study to determine how to establish stronger regional distribution solutions for small food producers. 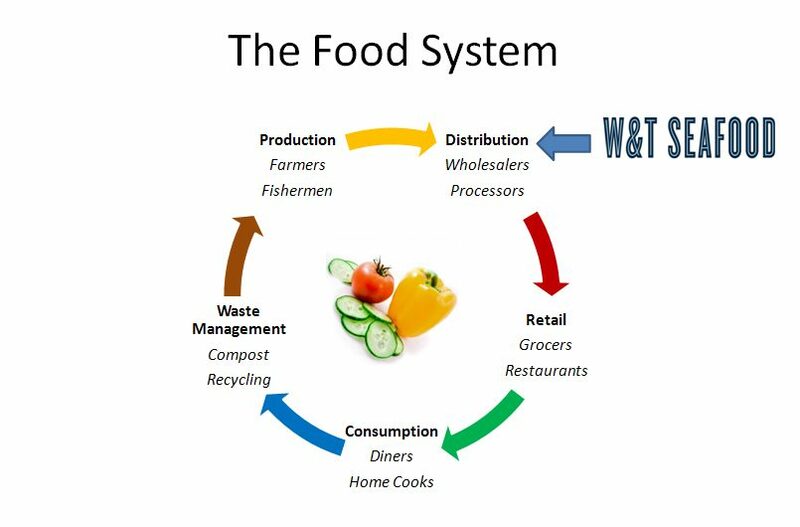 Above, you can see the food system, and how products cycle through from farmers to distributors, to retailers, to consumers and finally to waste management systems. Element Seafood fits in at the second stage, and works hard to connect the right seafood producers with chefs, grocers and diners. We take field trips to visit oyster farmers, and seek out partners who care about the integrity of their products and work to create unique flavor profiles. Then comes the heavy lifting, as we tackle the logistics, paperwork, and permits required for shipping. Finally, our sales team knocks on doors to get products into the hands of excited chefs and diners in New York City, where we’re known for having a carefully curated selection of premium shellfish. It’s hard to believe we’ve been doing this for over 25 years, and some of our relationships with shellfish farmers stretch back over decades!